Each one of them started this day fairly early, bleary eyes focused on upcoming sand and sea, but I was up earlier­ — long before the sun had started to fill the sky with light sliding gracefully between rose and whitest gray. Two days away at this time of year means instant death for tender seedling flats and potted plants – a great quantity of which inhabit a patio greenhouse on my deck. The most delicate are given space in the lifeboats first, coming in to fill my family room with all manner of green. I do a quick scan for poisonous tempters that may beckon sweetly to my home-bound Labrador, and close up the shutters to preserve cool air and moist soil. Outside in the garden proper, everything is so dry it seems pointless to fling a sprinkler about, so instead I play favorites and deeply water a first year Hydrangea quercifolia and a temperamental line of Caryopteris clandonensis ‘Longwood Blue.’ The others will have to wait for the rain we have endlessly been promised. No doubt it will arrive by November. And once at the beach; yes there is surf and sun and sand – a million beach umbrellas and endless pee-wee golf courses. There are boardwalks and bicycles and scooters that whiz through traffic on their way to al fresco lunches with blonde college sophomores named Becky. The hum of the East Coast summer is almost palpable. 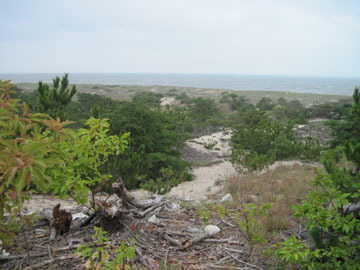 However, there are also new plants to be discovered in this little beach town a full zone and a half warmer than home. So while my children point and shriek at fiber glass volcanoes spewing red water on unwitting golfers, I am busy with research, reconnaissance, and if I’m lucky, a little bit of retail. There is no shortage of nurseries proffering exotic plants to tempt the gardener weakened by the taste of rum punch and the smell of boardwalk fries on sweet sultry evenings. These plants represent the promise of an endless summer – and those of us from cooler climes may buy impulsively – but sadly they will not survive our endless winter without a heated greenhouse or a spare room on standby. 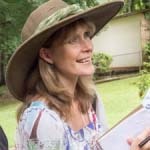 Often they are not even hardy to the climate of the nursery itself – but since when does truth have anything to do with sales? 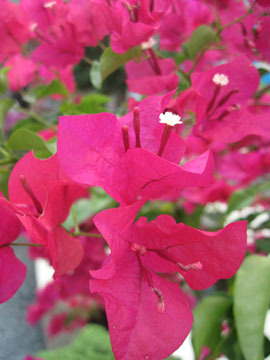 Here in this little Zone 8 town, Mandevillas, Bougainvilleas, and Never-in-My-Villas jump at the consumer with the brightest of yellows and the happiest of reds; yet I know that these beauties only thrive in a double-digit zone. I question the owner and she tells me how much they like the balmy, humid weather right now. So much for retail therapy. Notebook and camera it is then – documenting plant combinations like the nerd I will always be. Whether my toes are deep in the sand or painted pink for the evening boardwalk, I am scanning for new ideas. While the children shriek from atop a spaceship, I am enraptured by the fiery trumpets of common Campsis radicans peeking out from under an ancient seaside carousel – contrasting magnificently with the deep blue petals of a neighboring Nicotiana. 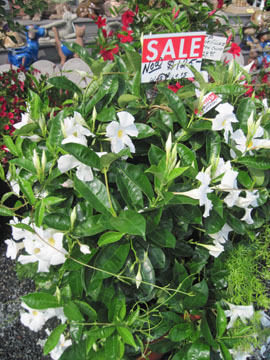 A white variety of Thunbergia alata climbs a cerise Oleander – and a mystery coleus invites a surreptitious tip pruning while the rest of my family visits the candy store for shark gummies and salt-water taffy. Later we eat candy apples in rapturous silence, and I show my husband my new trophy, swimming in a water bottle until we can get home to a dusting of rooting hormone and a pot. As we leave the next day I fight one last twinge to pull over and buy something frivolous to commemorate this spontaneous weekend – but since it will only commemorate it until our first hard frost, I settle for a different kind of frivolous – a purple dress with sequins that makes me smile when I twirl. Perhaps I’ll buy a hardy banana when I get home and call it good.